Each and every day, charities and philanthropic organizations around the world are advocating for people in need, fundraising to provide people with basic life necessities, pooling resources for research to find solutions to improve the lives of others, and providing them with a true sense of humanity. If it weren’t for these dedicated individuals who feel passion and empathy in their hearts to dedicate their time and support to the lives of those less fortunate, the world would not be as strong as it is today. 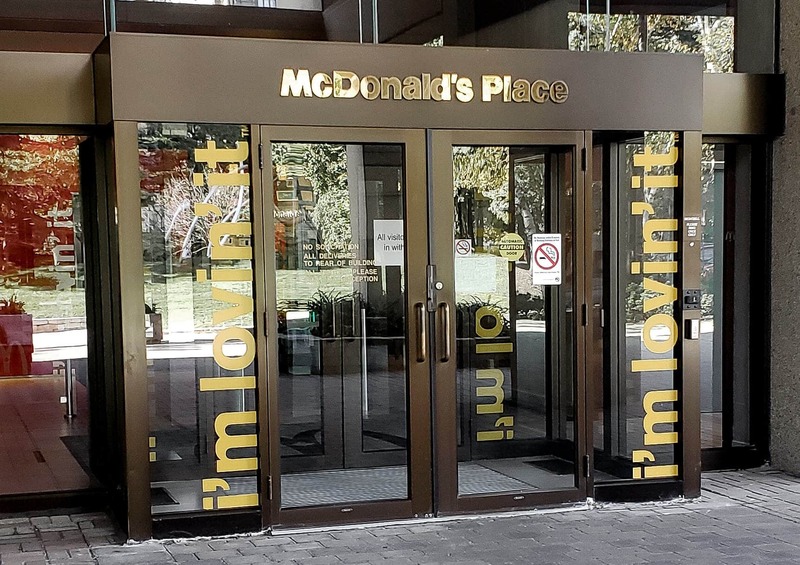 Photo: A McDonald’s Restaurant in Toronto, Ontario, Canada. One philanthropist and charity, I’d like to feature this month is George Cohon, founder of McDonald’s Canada and Russia, and the Ronald McDonald House Charities (RMHC). Getting McDonald’s established in Russia was another, more complicated story. There was the Russian bureaucracy to deal with, and concerns about whether the Russian people would even like or accept the concept of fast food. But George “pressed on,” and after 14 years of persistence, the first McDonald’s in Moscow opened on Jan. 31, 1990. 10,000 people were waiting in line by 6:30 a.m. The restaurant served 30,567 that day and broke the record of the most ever served at any McDonald’s in one day! People that came from around the world were asked to donate to the Soviet Children’s Fund and they raised $1 million! This rocky but successful beginning was followed by an economic crisis in 1998 that caused many Russians to lose their life’s savings. George could have packed up and left Russia at that point, but instead, he lowered menu prices and refused to lay off employees. Eventually, the economy recovered, and McDonald’s Russia thrived like the Canadian operation. 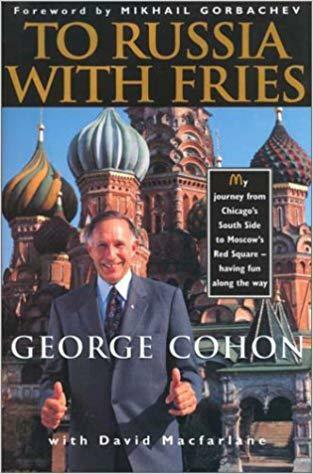 (If you’d like to read more about this, George published a book recounting his path to getting McDonald’s into the former Soviet Union, called To Russia With Fries. The book is a bestseller). As a world-renowned philanthropist, George’s record of public service extends even further than his work with RMHC Canada and Russia. He has also received the most prominent public service awards from three different continents. In Canada, he is an Officer of the Order of Canada and received the Order of Ontario. In Russia, he was named to the Order of Friendship and was given the Israeli Prime Minister’s Medal. He has received four honorary degrees from Simon Fraser, University of Haifa, McMaster and Guelph Universities. He has also received the Woodrow Wilson Award for Corporate Citizenship and is also a member of the Canadian Business Hall of Fame. 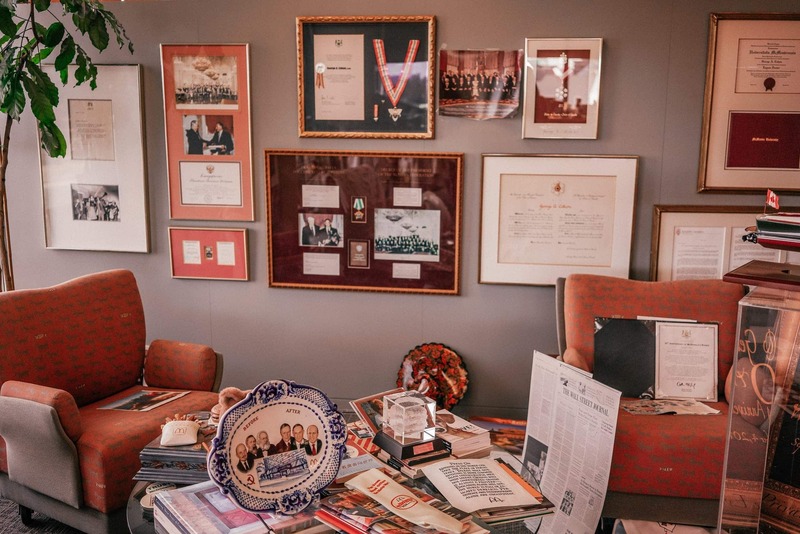 Photo: Inside George’s office filled with awards and recognitions seen here – Order of Canada & the Order of Friendship from Russia. 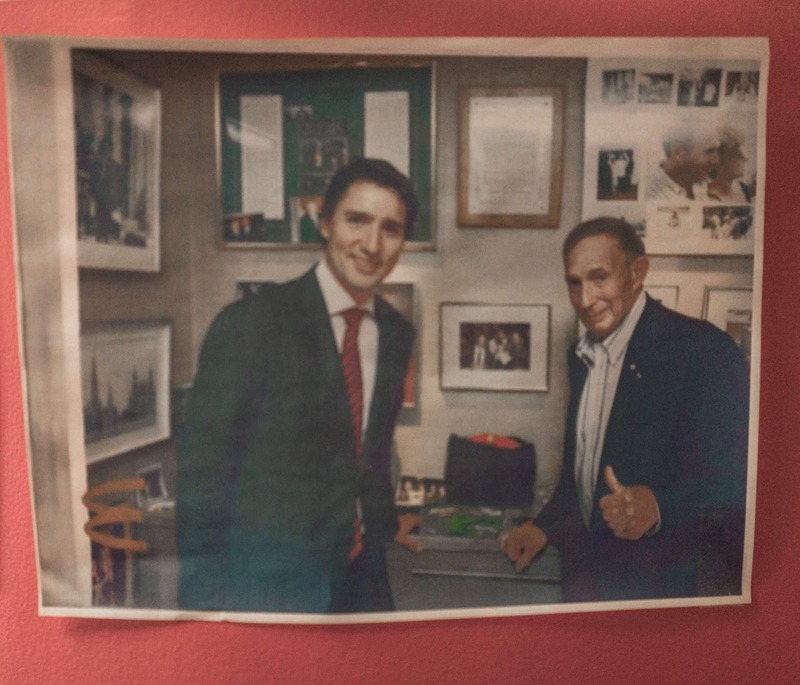 Photo: George with Canada’s Prime Minister Justin Trudeau, posing in front of a photo of his father, then Prime Minister Pierre Trudeau. To this day, George generously devotes his time to public service and supports a number of different charity organizations that are close to his heart including the Santa Claus Parade – where he is Honorary Chair, the Variety Village and the Rick Hansen Foundation just to name a few. 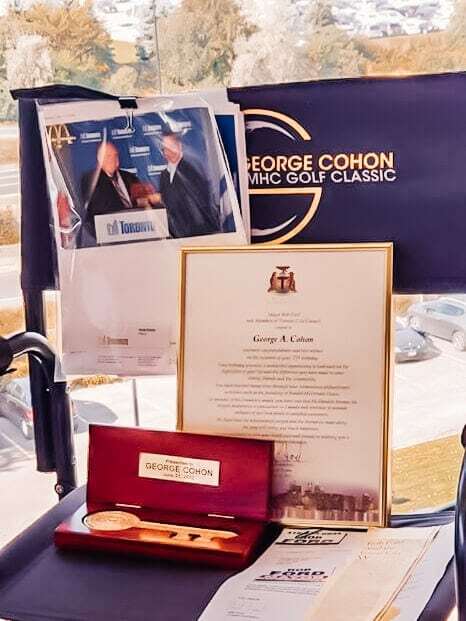 Most recently, at the annual George Cohon RMHC Golf Classic Tournament, he raised $419,920 this year and a total of nearly $4 million for RMHC families to date! And in addition, just this past weekend, George gathered up some of his tennis friends from the Royal Canadian Yacht Club and raised over $30,000! RMHC has solidified itself as one of the most influential and generous charity organizations in the world — and this is a true testament to not only to George’s incredible leadership but the continuous, unwavering support and respect he receives from his peers – both from the business and political community alike, speaks highly of his character as well. As I walked into the McDonald’s office for the interview, the environment of the office felt very open, and I could tell people were genuinely happy working there. It was clear they had a great boss, who genuinely cared about them. Good leadership always comes from the top, I thought to myself, and when people feel like they’re appreciated, valued and genuinely cared for, it breeds loyalty. 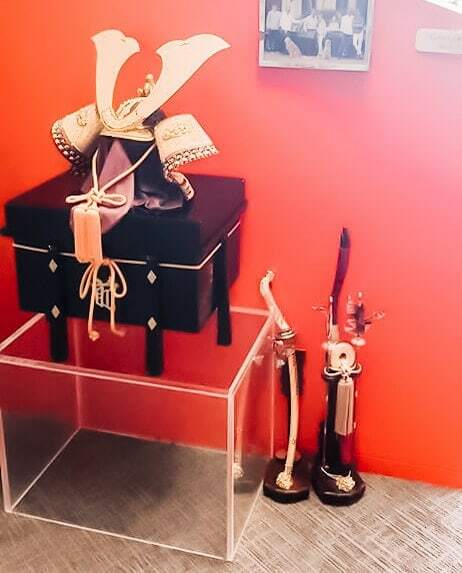 As I sat down with George, I couldn’t help but be intimidated by the endless amounts of awards, newspaper articles, medals, certification of achievements that surrounded me. 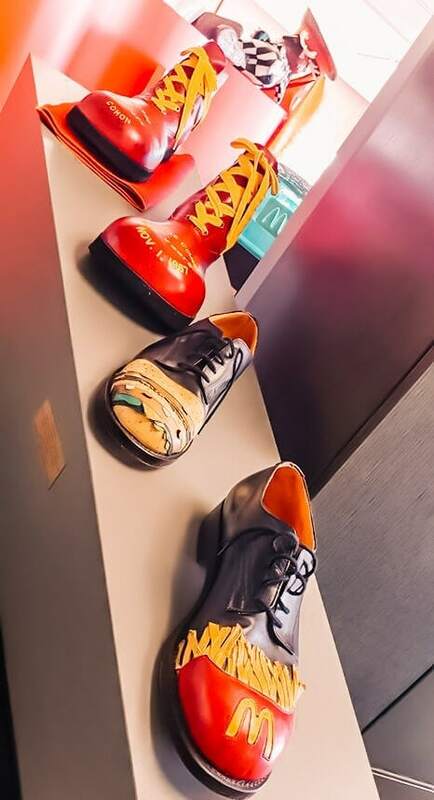 I felt like I was in a museum, but this museum wasn’t a collection of art pieces from multiple artists, it was collections of milestones reached by one single, person – it was remarkable. It would have taken me hours to go through them all! Q. Over the years, McDonald’s has supported so many charities, but your main focus has been about children and local communities, what is the driving force behind your philanthropic efforts in supporting children and why is it so important for you to give back to local communities? It’s part of my DNA, you probably get a lot of that from your parents, which I think I did. 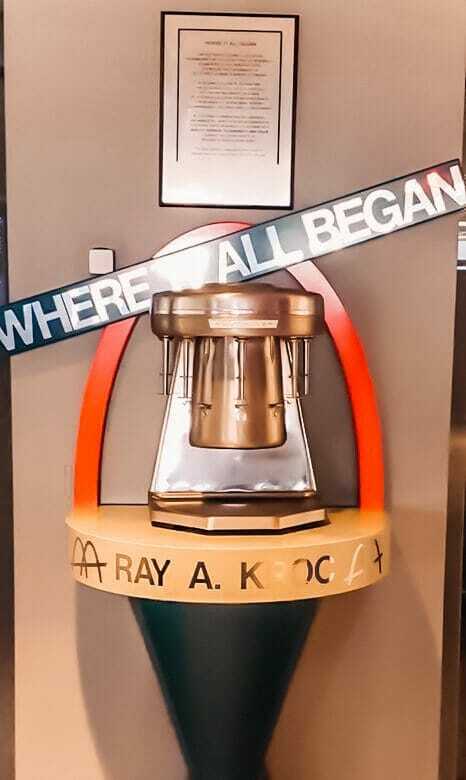 When I got involved with McDonald’s with Ray Kroc and Fred Turner, the founders said it was our duties to absolutely give back to the communities. And I’ve always thought children and their families are some of the people we should support and help – from day one we’ve always done that, it’s a duty and an obligation to do that. Q. Is there a story you’d like to share that stands out that really touched your heart? Well, there are all kinds of stories, I mean I could sit here for hours, but there was a story from last week that was sort of interesting. There’s a family at the Toronto Ronald McDonald House that’s been there for over one year, they’re from Windsor, Ontario and have five children and the second daughter has been waiting for a second heart transplant for a year. So, I said, “You’ve been at this house for a year, I want to take you for a boat ride”. I took the mother and her kids on a boat ride. It was an idyllic day, we spent about four hours on the boat that day and for me, that really touched my heart. Especially just seeing the one young girl – the one that was sick, and seeing her reaction being on the boat, I have a picture of her that I can get to you later (see below for photo). 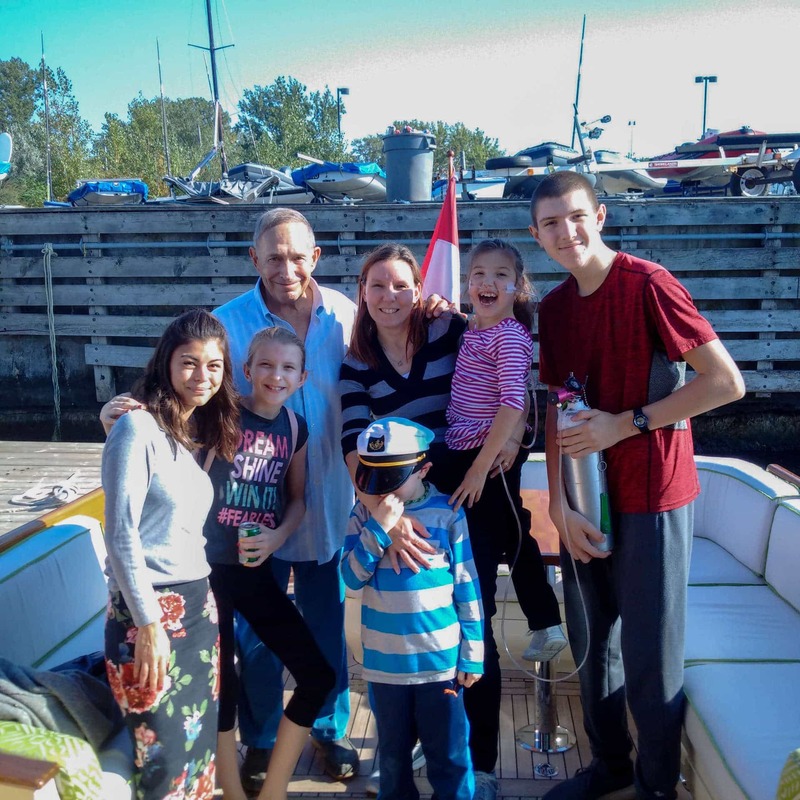 Photo: George with the family from Windsor, Ontario on his boat. Their daughter McKayla, needed a heart transplant and stayed at the Ronald McDonald House in Toronto. Q. Why is giving back such an important part of your life, not only through McDonald’s but in your personal life as well? What message do you want to send out to people about contributing to causes that are bigger than themselves? It just makes you feel good. If you’re so introspective that you don’t spend any time on activities that help other people, then you’re missing a whole part of life I think. So, I think when you give back to others, it’s a duty to society number one. Number two, you feel really good about it, that’s why I feel that it’s important for everyone to give back. Q. What is the proudest moment in your line of charitable work both in Canada and in Russia? Again, this could take hours to answer, there’s just so many different things. My answer to that one is pretty simple – it’s helping one family at a time. We, at McDonald Children’s Charities, go out and help tens and thousands of families. For me what’s important is helping one family at a time. It’s one individual family, each one is important. I could give you examples of families across the country that I’ve met where I feel good about helping each every individual one. I try not to get caught up on the raw numbers of how many. Q. So how do you choose who you help with all the overwhelming applications you receive? Usually, the hospitals give us a heads-up of someone who lives outside of Toronto that comes in with a child that’s really sick and they ask if there is room at the Ronald McDonald House and we try to find room for them. Q. The more I’ve been researching into volunteering abroad, the more questions have been raised about ethical practices of organizations and charities, how do you respond to people who question large corporations of getting involved with charity work just to promote their own brands? There’s a term that I recently heard that’s very interesting called “CAVE mentality” – “Citizens against virtually everything.” So, when I run into some that say, “You’re just doing this to sell more products”, I just smile and look at ‘em and say, “Well come to a Ronald McDonald House and after you’ve seen a house, tell me about that. Or if you go to Variety Village, and after you see what we’re doing with the kids tell me about it. Or look at the faces of the kids at the Santa Claus Parade, and them tell me about it.” These people have cave mentality, citizens of people that are virtually against everything, so if someone says, “You’re just doing this to make more of a buck”, they’re just negative people. Q. 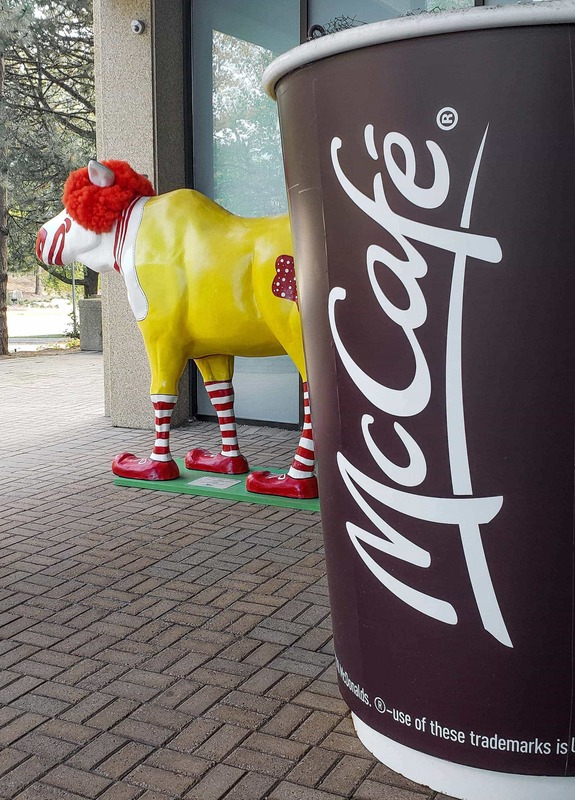 How do you incorporate the importance of giving back and charity work into the corporate culture at McDonald’s? It’s part of our DNA, it is part of our culture. It’s all the things we do at McDonald’s – whether it be selling cookies in restaurants to help the charity with McHappy Day (which has raised a tremendous amount of money for charity). It’s part of the culture of the company, it’s embedded in us, anyone in this building and anyone in the restaurants understands that it’s just part of us. It’s an integral part of our company. Q. What is your advice for people who don’t see the value in giving back to others? What message would you give people to encourage them to get more involved, especially for people that feel like they are only one person and feel like their work won’t make a difference? Get involved, be positive and not negative. One person can make a difference, you never know what you’re going to accomplish. You never know what you’re doing now, might affect someone in a positive way. So, maintain a positive attitude and don’t have the thought process that you’re just all by yourself, and that you’re not accomplishing something. Each person should look within themselves and figure out what they can accomplish to help others. Q. Were there any challenges you’ve faced in doing any charity work, in either Canada or Russia? And if so, how did you overcome them? There’s too many to mention. There’s a thing in my book – To Russia With Fries called “press on”. Perseverance and determination are so important. When you think you can’t get something done, just “press on”. I remember when I was in Russia, we had trouble finding a site and we just kept, pressing and pressing until we found something. So that took several years to get that going. So, I think what you should do is to keep continuing to “press on”, you don’t give up. You just don’t give up! Press On. Nothing in the world can take the place of persistence. Talent will not: Nothing is more common than unsuccessful men with talent. Genius will not: Unrewarded genius is almost a proverb. Education alone will not: The world is full of educated derelicts. Persistence and determination alone are omnipotent. Q. As a Philanthropist, the needs will always be bigger than what can be provided. As much as we hope to help everyone, we just can’t. How do you keep a positive outlook? I get requests all the time. You have to realize you can’t do everything for everyone. I remember talking to the head of a very important corporation, he said: “I’m getting tugged and yanked from 30 different groups, but my focus is on mental health and that’s what I’m going to focus on.” You just have to stick with charities you can focus on, for example, Ronald McDonald House is my main focus but there is another charity COPE Service Dogs, I’m fond of. A school teacher named Jane Boake from Barrie, Ontario, she trains service dogs that are given to kids at school who are having trouble at school. A child trains the dog, and by learning they can train the dog, the dog ends up with the challenged child. It’s an incredible charity and that’s one that I have a warm spot for. And although I can’t do as much as I wish I could do for it, I continue to support them. Q. A personal passion of yours is Variety Village and you’ve also been involved with the Terry Fox, Rick Hansen Foundation and chairing the Santa Claus Parade just to name a few, were there any causes you ever regretted supporting? If so, why? Never. No. There’s never anything I got involved with that I wish I hadn’t. I just wish that I could do more. If the causes are legitimate, like Rick Hansen – he’s going to be in town next Saturday and we’re going to have dinner together. I supported him from day one to this day. He’s an incredible Canadian, lots of energy and strength in him. Q. You’ve been such an inspiration to so many people, but who inspires you? I’ve been inspired by my parents, my relatives, my wife, my kids, my grandkids. The founders of the company, Ray Kroc and Fred Turner, very inspirational. I could look at Pierre Trudeau, who was a pal of mine. I could look at lots of Heads of State that have been inspirational, but one of the ones that sort of hit me are the parents of the sick kids. Some of these parents come in, and their children are fighting for their lives, and so they’re really inspirational to me. Lots of strength from them. These children don’t all make it, there are a couple that have passed, and I knew the parents really well. There was a boy from Greece, his name was Johnny, who was 10, an only child, passed away, a great kid. One day I saw him at the Ronald McDonald house and his hair was wet, so I said, “John where have you been?” He said, “I was swimming at SickKid’s Hospital, they have a pool there.” He said he loved the pool, but he said he wasn’t going back because he wasn’t a sick kid. It’s a hell of a line from a kid that’s dying of brain cancer. Another little girl named, Marlow that just passed away, both her parents are O.P.P. officers, again an only child, and she was 8 years old. There’s a women’s clothing shop around the corner, where I live that my wife occasionally goes to, it’s called Marlowe. I went in Marlowe and I said, “I work at Ronald McDonald House and there’s this little girl with the same name, I’m not going to spend $500 bucks to buy her a t-shirt, that’s not the right thing to do, do you have anything for her?” She said they had some promotional t-shirts, so I got one and gave it to her at the Ronald McDonald House. She looked at it and she said, “Mom I have to change the spelling of my name”. Her name was spelt M-a-r-l-o-w and the shop is spelt M-a-r-l-o-w-E. So again, it’s the parents and children that bring inspiration. You do whatever you can do to help. Q. 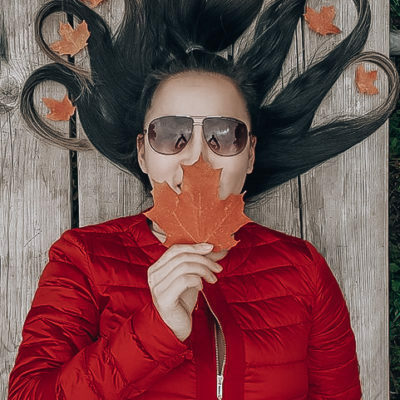 What would be your idea of spending a perfect day in Toronto (your favourite way to relax and activities that you enjoy, etc.)? Family time is great, I love family time. I love time with my wife, my kids and spending time with my grandkids (one of my favourites). I like hanging out at home and the Royal Canadian Yacht Club and go boating. Hang out there and play some tennis. Hang out at the beaches and go bike riding. Hang out at the golf club and play a round of golf. A lot of different things I like doing. Going on Thursday afternoons to the Ronald McDonald House with the therapy dogs – one of my very favourite times for me. Q. If you were to spend a few days in Russia, what would your itinerary look like (what is a must do, see, etc.) If, you had to host some of your friends in Russia, where would you take them? I’d take them to McDonald’s! There’s so much to see and do in Russia. I stayed at the Metropol Hotel for decades, I love that hotel. We opened a Ronald McDonald’s House in Kazan, Russia. I haven’t seen that House if I do go back, that’s something I’d like to do, and I’d like to see that House. There’s so much to see in Russia sometimes they don’t appreciate what’s really there. I just read an article on Russia being remade, the streets are different, there are walking paths, there are bike paths, etc. people have their own perceptions of what’s over there. When I used to travel there all the time, there were about 50 to 75 restaurants, now there are 700 restaurants. I like going to Red Square, I like walking through Red Square, I find that very interesting. I like looking at the churches, they’re extremely interesting. There are all sorts of stuff to do there. Q. What would we find in your travel bag? Anything you always carry with you or do you have any quirks or preferences in the way you travel? Aisle or window seat? I like aisle seats, close to the front if I can. I fly business, first class, coach, sometimes I charter my own private plane, so I can sit where I want! I always like to take a good book. I always like to pick books off KOBO. James Patterson books are always good. I just finished Origin by Dan Brown and Women in the Window, which are great books. I get the New York Times on Sundays and usually rip out the book section, and I look at the top books and read the reviews and I usually buy a bunch of them. I remember I was on a flight on the Concorde once from New York to England or Paris, and the woman that was sitting next to me was petrified of flying. She ended up being a well-known folk singer. I talked her through the take-off and landing to calm her down. Sometimes you meet an interesting person and sometimes you don’t. So, if you don’t meet an interesting person then you tend to sleep more! My favourite destinations: London, my son lives there. I like flying across Canada, Florida – I have a house there. I belong to a group called The Circumnavigators, you go around the globe in one trip. I’ve travelled to over 100 countries. Q. How do you maintain a healthy work-life balance? There is no easy answer to that question. I think it depends on your age. It depends on what you’re involved with work. 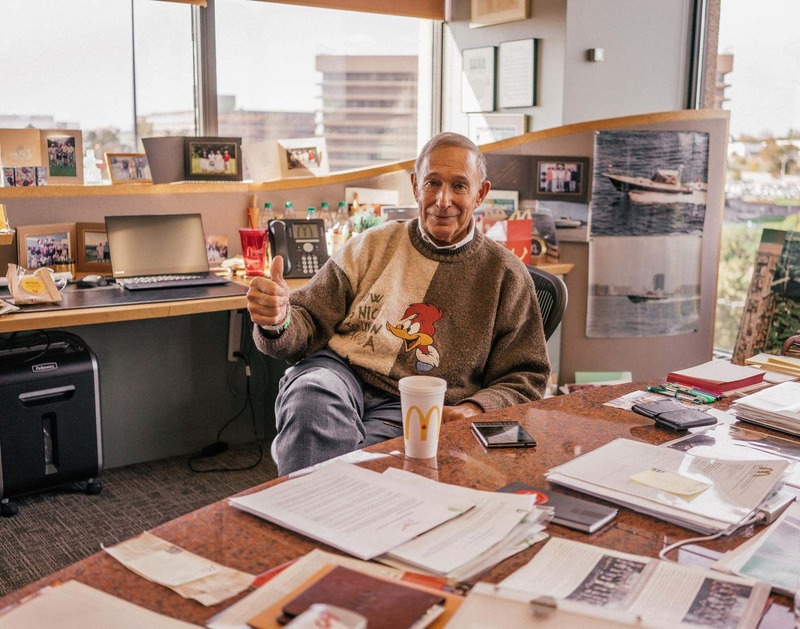 When I look back at my career with McDonald’s which is over 50 years, the work balance was working, working, working and home on weekends, most of the time. As you get older and as you turn more responsibilities over, your balance changes somewhat. Q. You talk about optimism and pessimism in your book, “To Russia with Fries” about your incredible journey of bringing McDonald’s into Russia after 14 years of negotiations. What is your advice to people on persistence and pushing forward on something they genuinely believe in despite being rejected? What is your advice on how to keep a healthy positive mindset and not letting negativity discourage you? You have to believe in something. If you just started something, how do you know if it’s going to work or not, well, you don’t. You don’t know if it’s going to work or not, but you have to believe in what you’re doing and look forward to coming into work in the morning. It’s not TGIF, it’s TGIM (Monday), T (Tuesday), W (Wednesday), T (Thursday) and F (Friday). If you have that attitude, you’ll get stuff done. And if you’re at a job and not looking forward to going to work, change your job and get out of it. When I was trying to get into Russia, there was tons of negativity I used to get – 1. You won’t cut the deal (it took me 14 years, but I cut it) 2. You won’t get employees, they won’t know how to work – well they’re phenomenal employees, they’re great, out of this world. 3. You won’t build great buildings – we currently have great restaurants there. 4. You won’t get a supply line, you’ll never get Russian product in the stores – when we started it was foreign products, but now its 80% – 90% local and 5. You won’t make money – we’re doing just fine. Negativity is just something I just avoid. Q. For entrepreneurs that are striving to build their own brands and companies, what advice would you give them? What are some elements of a great brand and what are some key points when trying to establish yourself as a leader in a particular market? Believe in what you’re doing. Believe in the brand that you’re building. Be passionate about it. Don’t be passive about it, be active about it. Be positive, and don’t be negative. Just try to keep going. You’ll run into obstacles along the way, there will be all sorts of people that will say it’ll never work. I’m sure other people that have built large companies have all run into these obstacles. Believe in what you’re doing and press hard. Sheer determination is important. On branding: I think what a lot of people forget is customer orientation, they’re so concerned with what they’re doing that they forget about how the customer perceives what they’re doing. In a company like ours, customer orientation is crucial. If we don’t check our egos at the door, then we’re in trouble. Now as you get older, it’s easier to check your ego at the door. I clearly check my ego at the door now with no hesitation, but if I was 30 or 40 years old, I probably wouldn’t have easily. Another thing is to be a good listener, if all you do is the talking, then you’re making a mistake in life. So be a very, very good listener. Don’t always think about what you’re going to talk about. You always need honest people around you. You don’t want to surround yourself with “yes” people, you want to be around people you trust and that will always be honest. Ray Kroc, our Founder had a saying, he would say, “None of us is as good as all of us.” If you think you can do everything all by yourself, especially at a big company like this and think you don’t need other people, you’re kidding yourself. It’s teams of people that do things to help you. Q. You’ve reached so many pinnacles in your life (to say the least! ), what’s next for someone who’s so well-respected and accomplished so much in his life? Just to keep going and keep going! I don’t have to come into work, but I love to and because I pretend to work then they pretend to pay me. It’s a great deal! There’s a great Russian proverb, pretend to work and they pretend to pay me! Because I think that it’s important when you reach a certain age, it’s when you stop working is when you run into trouble. I think you should do something, whether it’s charity work – you can’t just sit at home and waste away. I have amazing neighbours in Florida. Like a woman who just turned 100, she just went on a cruise with 27 of her relatives, kids, grandkids, great grandkids and she’s just vibrant, she’s just with it, she’s sharp. I know another woman in Florida, when I was on the Russian Research Center Board at Harvard and when I met her we really got along well. When we were once at the Harvard Russia Research Center, she told me when she was young, she rode a horse across Russia (Soviet Union) and just fell in love with the country. Very, very sharp. She was in her 90’s and I meet her – she lives down the road from where my wife and I live in Florida. She always invites us (my wife and I) for breakfast and/or lunch once a year. So, I asked her what she was going to do next year? “What are you up to Catherine?” She said on her bucket list at 103 years old (which I found interesting), she wants to go on a hot air balloon to the Sahara Desert, and also learn how to drive a Harley Davidson motorcycle. I said, “Those are nice things” and wished her good luck. In the next year as she turned 104, I get a Christmas card of her with a photo of her on a hot air balloon in the Sahara Desert. And another photo of her on a Harley Davidson with a strong trainer sitting behind her on the motorcycle. Then she had a line that I thought was a great line – “I lead the rest of my life like driving a car, 90% of the time you look forward, 10% time you’re looking in the rear-view mirror.” So, in my head that clicked, that’s the 90/10 rule. So, if you can live your life with the 90/10 rule, that’s a great one. She lived till 106. Q. An important message I hope that my readers will take away from my content is what the true meaning of happiness and what success really is – doing things that feed your soul as opposed to feeding your ego. I feel people concentrate on the wrong things and put too much emphasis on titles, how much we make and what material goods we possess, etc. The more I travel to give back, the more I find myself fulfilled and often I reference my heart being “full” because there is an underlining purpose and meaning in the work that I do. I hope to encourage others to be purpose-driven in what they do, not only in their travels but in their everyday life. This to me is true happiness. As someone who has so much more life experience and success in all areas of life both professionally and personally, what does happiness mean to you? So, what does it mean to you to be successful and happy? I’m very content. Success is different things, getting involved with other people and checking your ego at the door is a major thing. If you’re in a rat pack, all your doing is trying to keep up with the Jones’. If you’re in a group that says, “I have this, and I have that”, I think you lose a lot in life. And seems to me that success is something different, it’s not always money. If you go to music school and you end up being a great piano player and you’re successful at playing the piano. You may or may not make a ton of money, but you will be very well-respected. Success can be so many things, if you’re a social worker, if you start an NGO, it’s all kinds of different things. You’re successful because you’ve accomplished what you wanted to. It’s something more than dollars, it’s something deeper, much deeper. Get passionate about something. Get involved with something and whatever it is that you love to do, keep doing your thing. I had something great happen to me, I was at the yacht club on my boat, and I had a guy come up to me and say, “Mr. Cohon do you remember me?” I have this happen to me all the time, so my line is, “Good to see you, how do we know each other and when was the last time we saw each other?” And he said, “We haven’t seen each other in 35 years.” So, I said, “It’s been 35 years so refresh my memory”. 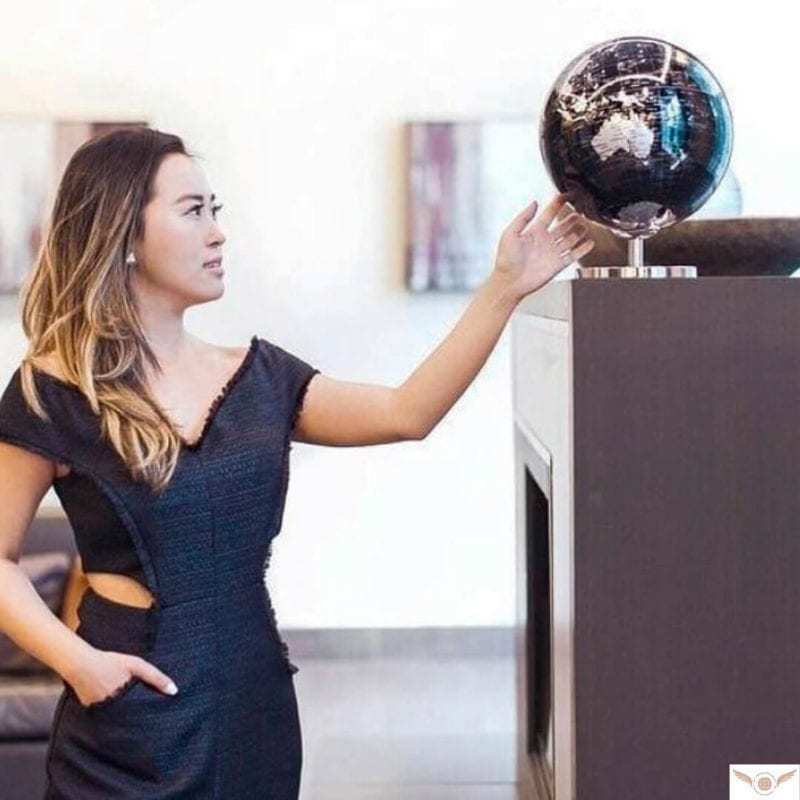 He said, “Well I used to have an office at Yonge and Eglinton and my first job was cleaning offices, and I was cleaning your office and you asked what I wanted to do with my life” and I said, “I want to be a pilot, I’m passionate about it,” and you said “Well good”. But I said, “My dad told me not to dare think about that, and don’t think about being a pilot.” You told me, “With all respect, I think you should go for it and be a pilot.” So, he came up to me and said, “I’m an Air Canada pilot for 30 years and I’m one of the top captains at Air Canada.” And it was so nice to hear that story, it felt nice to hear that. It felt good. I don’t think people realize just how competitive I am. I think they see me as this easy-going guy but I’m extremely competitive. Q. What is your favourite thing on the menu? I like a quarter pounder with cheese, and sometimes I would say, “hold the bun.” I try to keep in shape! Q. So what’s the secret to your management style? I can tell people are happy working here and you seem very approachable to your employees. I’m not telling you, that’s a secret! George currently lives in Toronto with his wife Susan and their two therapy dogs, Simmie and Annie. 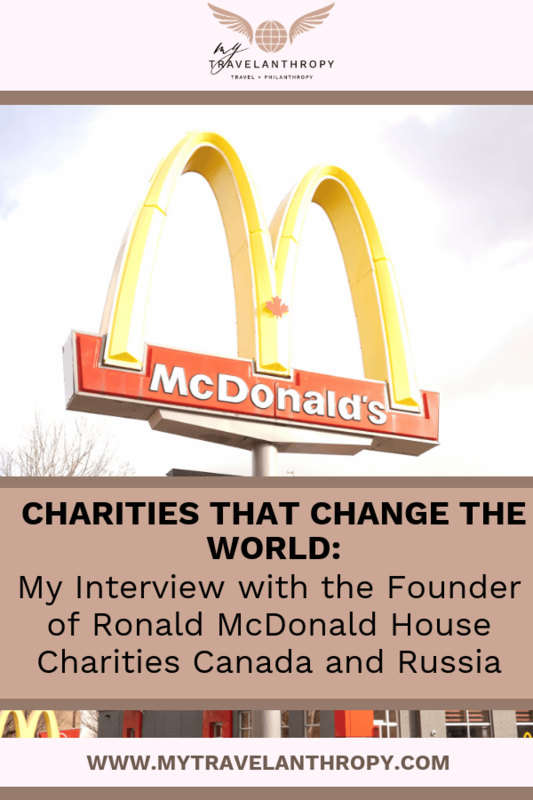 After seeing the tremendous success of McDonald’s restaurants in both Canada and Russia, George founded Ronald McDonald House Charities Canada and Russia. RMHC works to create a haven for parents and children as a place to stay during difficult times when receiving medical treatments. RMHC was chosen as this month’s charity of the month because of their extensive effort to help children and families unite within their spaces. Their mission has always been clear: to provide a “home away from home” for seriously ill children and their families to heal better together— one family at a time. By providing a safe space for children and families suffering from illnesses, diseases, or other health-related issues, they improve the lives of those going through extremely trying times. 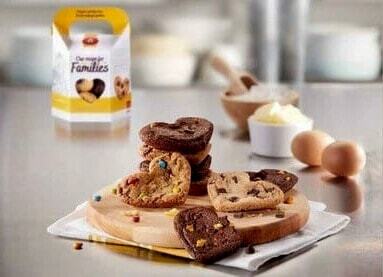 There are times when the sweet smell of baking cookies is just what the doctor ordered. This certainly was the case for Kris Trafford (originally from Melancthon, Ont. ), whose infant son Brody spent more than four months receiving treatment for a life-threatening intestinal disorder. Kris stayed at the Ronald McDonald House in Toronto while Brody was being treated. 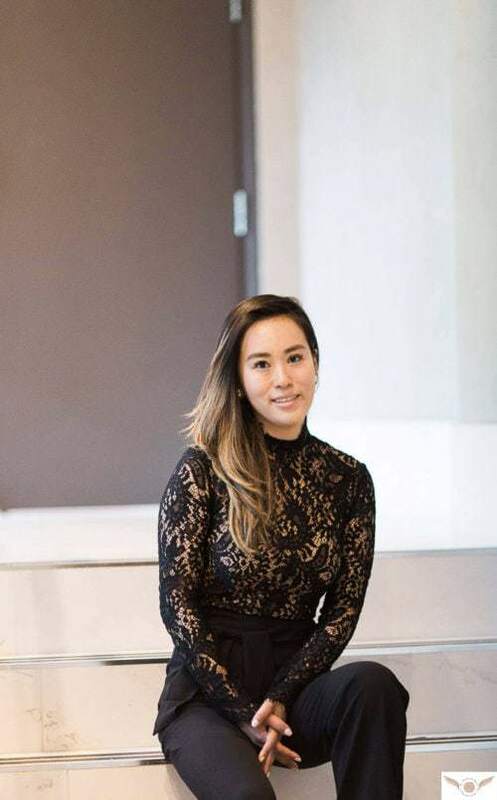 Visiting her sick child day after day at the hospital was emotionally and physically draining for Kris, and when she went back to RMHC Toronto at night, she needed something to lift her spirits. And that’s where the importance of the cookies come in. Kris started baking cookies in the kitchen at night, and before long other families started gathering in the kitchen, lured by the smell of freshly baked cookies. The cookies and company were a welcome relief for families who’d spent all day at the hospital like Kris. They were able to smile a little, and it was a way to bring memories of home, love and warmth into the House. Cookies have such therapeutic value that RMHC Toronto eventually recruited volunteer cookie bakers, and this evolved into a fundraising program called RMHC Cookies Charity Campaign, which was launched in Canada on October 2 of this year. This program supports the country’s Ronald McDonald Houses and Family Rooms, and with each heart-shaped cookie sold at McDonald’s restaurants, five cents goes towards helping families with a seriously ill child. By the end of the campaign, they had generated nearly five million media impressions. This vast marketing effort is another indication of one of the many ways RMHC is helping local communities, not only in Canada but also worldwide. Just last week, RMHC gave 18-year-old Cancer Survivor Emma Collins the opportunity to share her story and experiences at RMHC in Toronto. After being diagnosed with Leukaemia at age 14, Emma and her family were forced to travel from their home in Muskoka to Toronto, so she could receive her extended three-month chemotherapy treatment. During that time, the family was far away from their home and often struggled emotionally with Emma’s diagnosis. The Ronald McDonald House Charities Toronto stepped in to provide the Collins family with a place to stay during her treatment. They provided her with a sense of normalcy in a safe, judgment-free, secure environment where she could continue to live like a teenager, even when her cancer snuck back in again a few years later. The RMHC provided Emma with the chance to have sleepovers with her friends, as she often did prior to her life-changing diagnosis. But most importantly, the RMHC gave Emma the support she needed to gain the courage to fight back against her diagnosis. It’s heartwarming stories like these that have led me to choose the RMHC as Charity of the Month. And while one can go on through an endless list of RMHC’s success stories, it is sufficient to say that RMHC’s efforts to make a difference in the lives of others is unparalleled amongst the massive roster of philanthropic and charitable organizations around the world. Throughout Canada, Ronald McDonald Houses serve nearly 51% of the families of sick children. And there are more statistics to show what an impact the RMHC has made for families. 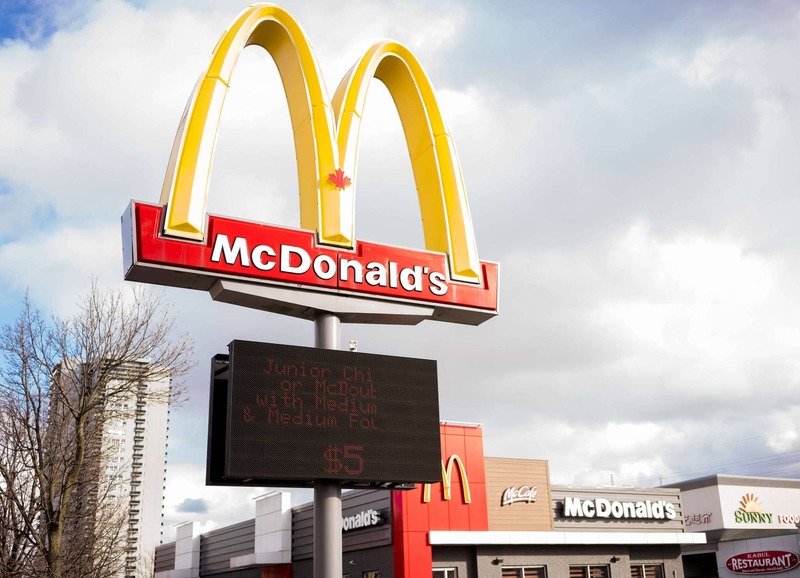 -McHappy Day, now a Canadian Tradition and adopted by other McDonald’s restaurants around the world, has raised $70 million in Canada and more than $170 million (USD) worldwide for RMHC and many local children’s charities. -Ronald McDonald Family Rooms—designated spaces in hospitals for the relatives of sick or injured children—welcome more than 10,000 families per year. 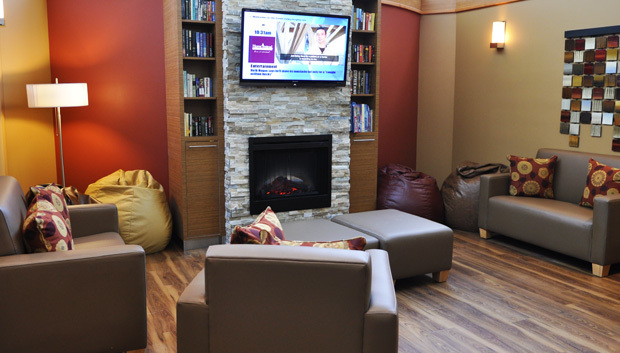 RMHC Toronto accommodates up to 81 families per night. -These Ronald McDonald Houses served 40,762 dinners in just one year, through RMHC’s Home for Dinner program. -Ronald McDonald Care Mobiles have assisted over 7,000 families in Canada, and travelled more than 74,000 kilometres since their launch in 2012. -RMHC Canada features 283 committed staff members and 6,000 passionate volunteers. For information on ways you can help, please visit www.rmhccanada.ca. Wow that was truly uplifting and inspiring. Everyday, seems like no matter what day it is, when you turn on the TV to CP24 or a new channel or when you read the newspaper or turn on 640 on the radio, all you hear about is negative, bone shilling news. Our world these days has been turned upside down. It was nice for a change to read about something good with this world and the good people that are doing their part to make it better – to help out one another. George Cohen’s genuine generosity and outlook towards life is contagious and filled with positivity – something we all need more in our life. 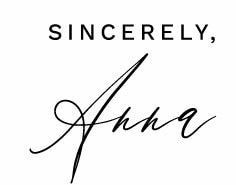 Fabulous, article , Anna. McDonald’s does so much great charity work around the world! What a fantastic read and inspiring story! Great interview, so interesting learn more about all the good work he and McDonalds are doing! Fabulous & extensive Q&A on McDonald’s & their charitable work! Although I did know a little of it & RMHC – it was greet to read the interview with George Cohon. Thanks for highlighting Anna. What a great article on such an inspirational man! What a wonderful story. I really enjoyed the Q&A! A very professional job that you have done here, Anna. This interview was very in-depth and informative. I read an article and an interview with George Cohon a few years ago in Report on Business and you have provide a most comprehensive update on the incredible person. Excellent work! Very well written and inspiring article. He sounds like a very down to earth man. Such an inspirational journey! I totally agree that good leadership always comes from the top. Thank you for showing the world through your actions how much we can lend a helping hand to others. Your life stories are so motivational, and you’ve lead a meaningful and fruitful life. You’re a role model for me, and I will persevere in achieving my dreams. What a well written, thorough and extensive article, it’s great to share the experience of individuals who love to help others especially when they have the wealth and power to ignore these challenges we face. Thanks for sharing. This is such an inspiring story! What struck me in the beginning was the mentality of going for it, and working really hard to achieve your goals and ambition. And after achieving success, being able to do things and give back to the community which is incredibly wonderful. And his advice on going for it and doing what you’re passionate about really inspired me! Great interview Anna and thank and you for introducing such an inspirational and brilliant man :). Very unique interview. Great questions.